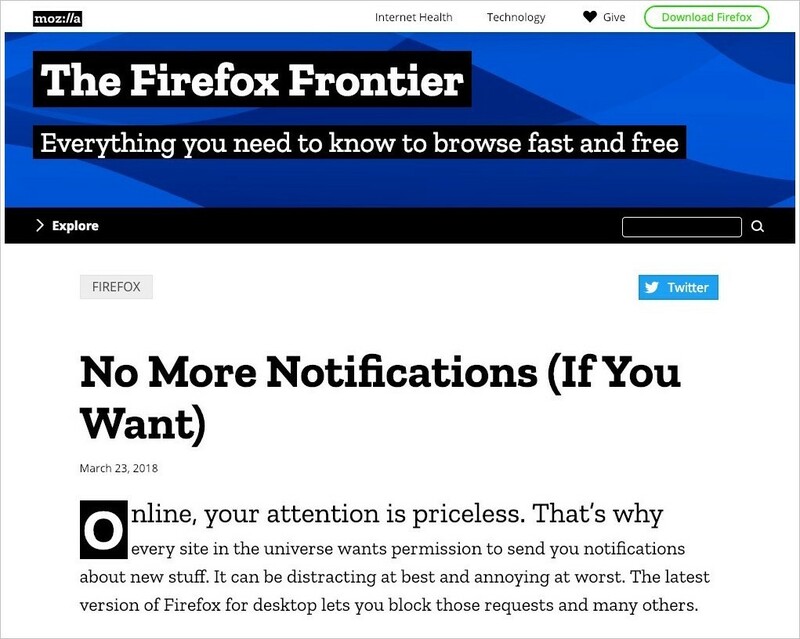 Let’s face it, on the web, push notifications have become a bit of an omnipresent annoyance. The reason for the bad reputation of push notifications—in my opinion—is that we have been, well, a bit too “pushy” in trying to get people to allow them. “Why Build Progressive Web Apps,” episode 2: Push, but Don’t Be Pushy! First, maybe let’s take one step back and brainstorm why we would want push notifications in the first place. If done right, push notifications are actually pretty great. For example, they can inform you if you have been outbid on an auction site. They can alert you about severe weather conditions in your hometown. On a less serious note, they can notify you when you have a match on a dating site. Or they can let you know if there’s a significant price drop for something you’re interested in. And yes, of course push notifications can also inform you of new content on a news site. As I wrote above, there is no way on the API-level to inform users about the context of push notifications. All you can do with the options parameter is set a flag whether the notifications should be userVisibleOnly, and provide the applicationServerKey. In consequence, it’s crucial that we as application developers provide the context for our notifications ourselves. Maybe you remember the 🐈 AffiliCats sample app from the first episode of “Why Build Progressive Web Apps.” It’s a simple app that simulates a comparison site where you can get great offers for cats. What’s new this time is a button for getting price drop alerts. 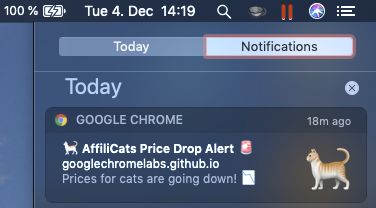 🐈 AffiliCats app with price drop alerts (Source: https://googlechromelabs.github.io/affilicats/). When you press it for the very first time, the notifications permissions prompt pops up, and it’s immediately clear that it’s related to the price drop alerts. So you can see, prices for cats are dropping, you better get one while they last. And there we have it, an actually useful push notification. It was contextual, meaningful, and timely. The 🐈 AffiliCats app is open source, go check out the source code if you want to see how it’s implemented. Push notifications are a great power, and with great power comes great responsibility. If you remember one thing from this write-up, I hope it’s context matters! In the next episode of “Why build Progressive Web Apps,” we look at another PWA super power: Add to Home Screen! Looking forward to reading our seeing you! In order not to miss it, subscribe to our Medium Dev Channel, the Chrome Developers YouTube channel, follow @ChromiumDev on Twitter — and if you like, I am @tomayac almost universally on the World Wide Internet.